I was out at the railroad I help with yesterday and noticed one area that because of all the recent rain, had a lot of moss growing. I decided I wanted to get some macro photos and while getting ready, this guy came into view. I found out after I photographed it that it was a Jumping Spider so I was pleased it just sat there while I photographed it and didn't decide to jump at me or my lens. 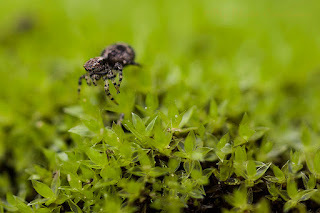 😄 I was proud of myself for even taking this as I am not very fond of spiders and glad that it turned out pretty well.